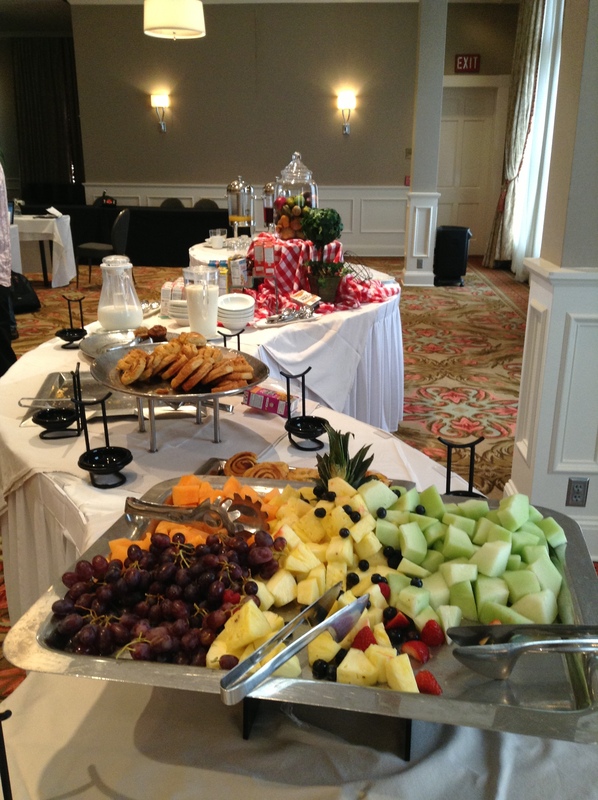 Morning breakfast buffet including fresh cut fruit, danish/pastries, cereal, and yogurt. Day 4 of the Penrose/Chapman conference was the last full day of the meeting – and what a full day it was! The fifteen talks were split among two themes: “Using combined field results and numerical models to predict coastal change at decadal and century time scales,” and “Integration of Science and Policy.” But before I dive into the information from the morning, I want to address a question I get from students once in awhile…. 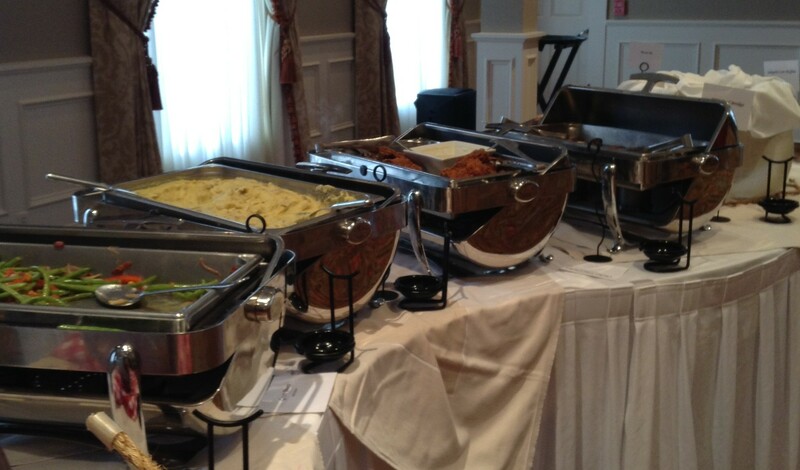 “do they feed you at these meetings?” The answer is – yes! The photos with this posting will show you the breakfast buffet (with wonderful fresh-cut fruit) every morning, and the lunch buffet every afternoon. We were on our own each evening for dinner, having the opportunity to go “out and about” on the town of Galveston (keep in mind that our conference was during the off-season of this tourist destination – not much was open around the hotel). Creating computer models of coastal systems is critical to understanding and making predictions about the impacts in and on the environment. Models help scientists with the “what-if” scenarios – “what if” sea level rises, “what if” sediment supply decreases, “what if” a dam is constructed on a river, etc. Overall, the best presentations of the morning were the ones enhanced by videos that showed the migration of barrier islands under different environmental scenarios, and the movement of sediment through delta tributaries, etc. But an important take-home message of the morning was that more data is needed for better models, especially data being collected on a continuous basis in the modern-day environments. Today’s lunch included salad, coleslaw, steamed green beans, mashed potatoes, fried chicken, beef brisket, jalapeno corn bread, and pecan pie. Right before lunch (see the buffet image), the group heard from Melanie Fitzpatrick of the Union of Concerned Scientists. She distributed to the group a handout her advocacy organization created on Causes of Sea-Level Rise: What the Science Tells Us. The idea is for the publication to be distributed to everyone from reporters to Congressional staffers – but I think even undergraduate students could benefit from reading these well-written and extensively-cited publications. I know I will certainly be spending some more time on their website and looking at their resources. The afternoon started with some additional modeling talks. I learned about specific processes occurring in regions from North Carolina to South Korea. I even learned a new term today – ecomorphodynamics (that’s the interactions between biological and physical environments). The talks then shifted into looking at human/environment interactions and reactions. Stan Riggs (East Carolina University) shared his interesting ideas for a sustainable eco-tourism future in North Carolina, while another speaker warned us all to think about the energy costs that will be involved now and in the future for environmental management. The talk that looked at integrating natural and social science was right on point, stating that we need to learn the indigenous knowledge and hear the stakeholder voice for any project we do in any region, as engineering projects may be futile in there is no local buy-in or ownership or ability to maintain constructed structures. In addition, he asked us to consider that migration may not be a response to stress, but a response to opportunity. The final speaker addressed “scientific consensus” – which I’ll wait to address tomorrow, which is part of the morning panel. One of the statements I heard today that I’ll end this post with…. Is the scientific solution the best solution? This might even be a great final exam question for students! Hmmmm…..